Imagine sitting in a local coffee shop with your best friend, steam rising from two cups of java and nothing but time to examine your life. Lots of Candles, Plenty of Cake evokes just such a picture. In her breezy conversational style, Anna Quindlen expounds on subjects that are sure to touch every reader in some way. From convent school and class reunions to female friends and long-lasting marriages with the right man, she offers her perspective after having experienced them all during her six decades on this earth. Ms. Quindlen’s comfortable, familiar, honest, and, at times humorous tone makes the reader want to remain in that virtual coffee shop long after reading the last page–and also do a bit of introspection. As the title implies, the subject of aging underlies the content in this book. Lately, a variety of such stories have hit the shelves in chain stores and online markets, but in this particular version Ms. Quindlen tackles the subject with her typical fresh and no-nonsense style. She dives in with one of the most obvious signs of aging: the breakdown of the physical body. With a no-holds-barred attitude, Ms. Quindlen compares hers to an appliance that breaks down after years of use. After all, having had three children and undergoing the different cycles of life, her outward structure is well worn. Describing her body as “a personality delivery system,” she cites the changing mindsets she has experienced throughout her lifetime, given a particular situation. For instance, as she heads to the doctor’s office for a mammogram, she faces what she calls “Mortality Monday.” Adhering to this prescribed preventative care dredges up the real possibility of terminal illness for the author. Female readers will never again approach this dreaded examination with the same mindset. As young mothers, we believe “children before our own had been raised by wolves.” She admits to embracing this philosophy until the 1990s when a southern woman admonishes her for one of her columns that presents “new” insights about working and raising kids. This Pulitzer Prize winner’s universal appeal, which, at times, surprised her—“Sometimes I would think I was the only person alive concerned about some crazy cul-de-sac of human behavior. Then I would get the letters from readers and realize that that was not the case, that we were not alone, any of us”—shines through in Lots of Candles, Plenty of Cake as well. Readers will certainly identify with the themes Ms. Quindlen weaves throughout this book. 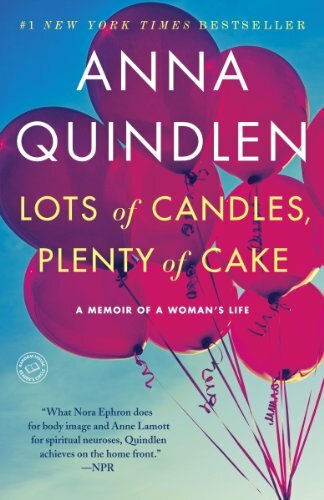 Lots of Candles, Plenty of Cake is a story of balance, strength and persistence, a true celebration of life and the advantages, challenges, and excitement of living in these times. Phyllis Hanlon’s book reviews have appeared in Addiction Professional, Behavioral Healthcare Tomorrow, and Science & Spirit.